Last Friday, I had the privilege to minister to a family in our congregation, in the loss of the patriarch of the family had gone home to be with the Lord. His name was Vernon Logue. Vernon and his wife Joyce have been members of Magnolia Church for more than 40 years and they are very well known and deeply loved by so many people. In the 18 months that I've been here now serving as the pastor of Magnolia Church, I was able to get to know Vernon, but not nearly enough as others had in the past, previous pastors who had known him much longer than I. But during those times over the last 18 months, I was humbled to know that Vernon and Joyce prayed for me and my family every morning and evening. He was the humblest of men I've ever met and it was only attributed to his love for the Word of God in his life that he read every day, especially reading Proverbs, which was his favorite book of the Bible to read also. His loss hurts us all, but none more than his wife and family. Vernon's passing last Monday morning came too soon, as he and his lovely wife would have celebrated their 60th wedding anniversary on Thursday. I was unusually extremely nervous to preach this funeral and I have no idea why. But I had been praying and knew that there were some folks in the congregation who were praying for me as well and I thank God for helping me in the preparation of this sermon and for the strength He gave to me, to proclaim the truth of His Word, to all who were there to listen. May these words cause you to consider how will you live when you die. BIG IDEA: Jesus is eternal life to those who put their faith in Him, the hope for tomorrow that can’t be ignored today. A question lies buried in the heart of every man from the beginning of history. "Is death the end?" For Martha, in this passage, she was a close friend of Jesus, as was her sister and their brother Lazarus. 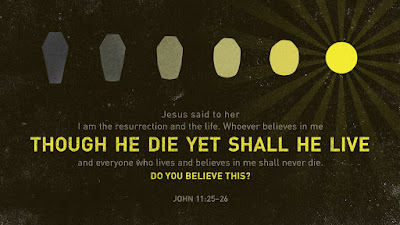 She believed that one day in the future, her brother would rise from the dead at the very culmination of prophetic events that would lead to all believers to be resurrected from the grave on that day. Martha’s only misunderstanding was that Jesus wasn’t speaking of a future event for believers to experience. His words are in the present tense when He said, “I am”, meaning the claim that He making was personal and it was in Him alone and no one else. It was now, not tomorrow, or at some point in the distant future. Jesus said quite clearly and with absolute certainty that He is the one whom has the power to bring the dead back to life, to give new life, who is the reason for eternal life upon death. This is why Jesus makes an exclusive claim for you to believe. New life, eternal life, life in God is because of Him and no one, or nothing else, but Christ alone. In today’s society, there are all kinds of things in the health and beauty marketplace that attempt to prolong our lives, as much as possible. Quitting smoking may help prevent further damage to the lungs, quitting drinking may help prevent further damage to the liver and the functioning of the human body. One thing is certain however, we will all one day die. No matter how hard we try to extend our lives, God is in full control and knows when that day will be for you and I and it is best to be prepared well in advance of that day too. Vernon knew he was getting tired, more than he preferred, but he didn’t do anything to make himself live longer, except that he would enjoy reading God’s Word everyday with his wife and to pray together twice a day too. Vernon’s hope was in Christ maybe since before 1974 when Joyce had given him this bible. For the last 42 years, or more, Vernon knew that one day, even though he would get older, his heart would get a little more weaker, yet, he grew a little more wiser still, from reading Proverbs daily, one day he would die, but yet he would still live when he died, why? Vernon believed in these very words that Jesus spoke to Martha in the text. Whoever puts their complete trust in Jesus Christ, for the forgiveness of their sins and the salvation of their souls, death will only be a matter of taking a nap in this mortal body and awaking, in a glorious new body and in the glorious presence of Jesus Christ in heaven. When Jesus spoke and said, ‘whoever’ that means that not everyone would choose to accept this offer that is being given to them. This is why Jesus said this not just to Martha, but for every person who would come to hear these words that He said and to understand them clearly. It’s a sad reality that people put more thought, effort and energy into how they will plan to enjoy a vacation each year, or how they plan to live in comfortably in retirement, more than how they plan to live after they die. How a person wants to live after they die should be considered even more than how they plan to do anything else in this brief span of time God has given to us, because heaven is going to an eternity of joy and praise to God forever, but hell is going to also be an eternity of pain and suffering, which makes Jesus’ words even more important to consider for themselves. When I die, how will I live? If your faith is in Christ alone, then you have the guarantee of living because Christ lives. If your faith is not in Christ alone, when death comes and it will, will you enjoy living in hell? This is why Jesus makes an exclusive offer for you to consider. There can be no greater confidence that a person can have than knowing that no matter what happens to them, because their faith is in Jesus Christ, trusting Him for the forgiveness of their sins, granting to them by the grace of God the promise and provision of eternal life in heaven, death is only a transitory experience. Death, for the believer isn’t permanent at all, it’s only temporary because one day our bodies are going to be met with our soul and both will be reunited. Those who have been genuinely born again believers in Jesus Christ, as long as you live and have put your trust exclusively in Him, you’ll never die because Jesus lives forever. 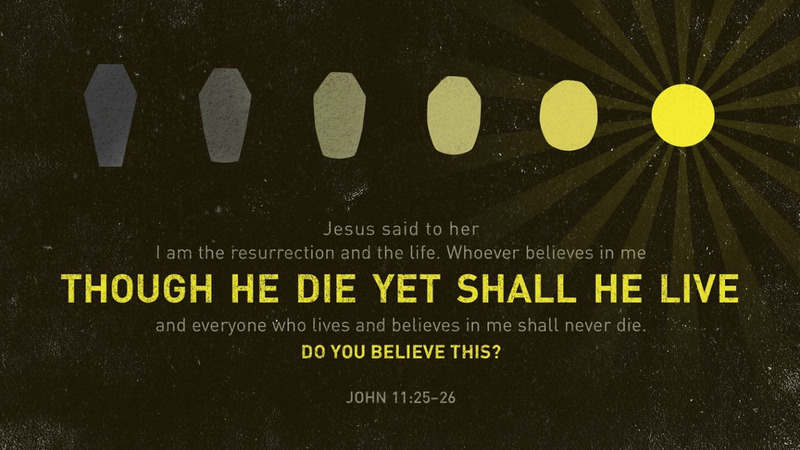 Is your confidence in Christ alone, as death gives way to your eternal future? Lastly, why Jesus is the resurrection and the life. Jesus asked a very simple, yet direct question that must be answered by each one of us today. The Greek word here for believe is the same as it is in verse 25, which means to commit one’s trust, to have confidence in something believed, faith that is exclusively in Jesus Christ alone for the purpose of forgiveness of sin, salvation and eternal life in heaven. Jesus was asking Martha if she believed that He is that hope for not just her brother, but for herself. He asks through the pages of Scripture as they have been read to you, as I have spoken them in your hearing today, do you believe this? Do you believe that Vernon is not merely in a better place, that heaven wasn’t automatic for him because he just lived a good life and God was not part of it? He’s not in heaven because he was a good person either because Vernon was still a sinner the day he met Jesus as his Savior. Jesus Christ, who knew no sin but became sin for Vernon, so that he would become the righteousness of God in Christ. Do you believe that Vernon lives, even though he is dead? There is great joy in knowing this that as it is for him, so shall it be for me and so shall it be for all who put their faith in Christ alone, as Vernon and his beloved wife has done too. Friends, Vernon Lee Logue lives because Jesus Christ is the resurrection and the life. He lives because HE lives. Vernon lives because of the exclusive claims about Jesus. Vernon lives because of the exclusive offer that Jesus offered him, one day long ago. An offer that he did not reject, but humbly received. Vernon lives because of the exclusive confidence of trust that he did not put in himself, but in Christ alone. Vernon lives because he made an explicit choice, one that I am confident is one he has no regrets having made. How will you live when you die? How are you living now?